Beckers Perfekt Impregnating Oil. A priming oil for the protection of joints, end grain and other exposed parts of exterior wood. Soaks well into the wood. Beckers Perfekt Impregnating Oil 1L is a priming oil for the protection of joints, end grain and other exposed parts of exterior wood. It soaks well into the wood fibres and gives good protection against water absorption. This in turn reduces the risk of the wood cracking and the paint blistering. 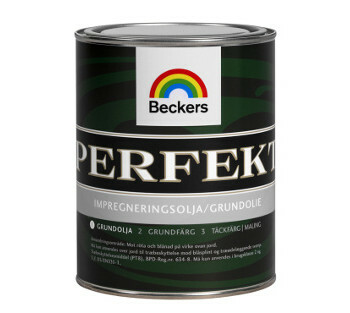 Beckers Perfekt Impregnating Oil also provides very good protection against rot and blue stain. 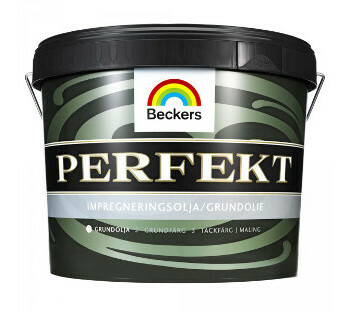 Note: When painting windows, follow the instructions for Perfekt Fönsterfärg. You can paint over with water based paint finishes after about 30 minutes and with solvent based finishes after 6-8 hours. Approx. 5m² / liter (equivalent to 180-220ml / m²) depending on the substrate absorbtion.